For those of you who don't know, WheelTurnerHawaii has been throwing the Hawaii Winter Outlaw Series circuit on the Islands for quite some time now. When its cold, with bad weather everywhere else... get out to Hawaii for some true Hawaiian style underground racing. Just because we are outlaw dosent mean we don't get our fair share of Top pros in the game out to our events! If you missed the last series or just want to remember the good times, click below to see the write ups, videos and photos from this past series. The WheelTurnerHawaii Oldschool Sidewalk Surfing Showdown a Success. Mahalo to everyone who came out to yesterdays WheelTurnerHawaii Sidewalk Surfing Showdown. Everyone was jamming hard and smiling big. Congrats to Max Turetsky for taking home the win. A full write up and photos coming soon! 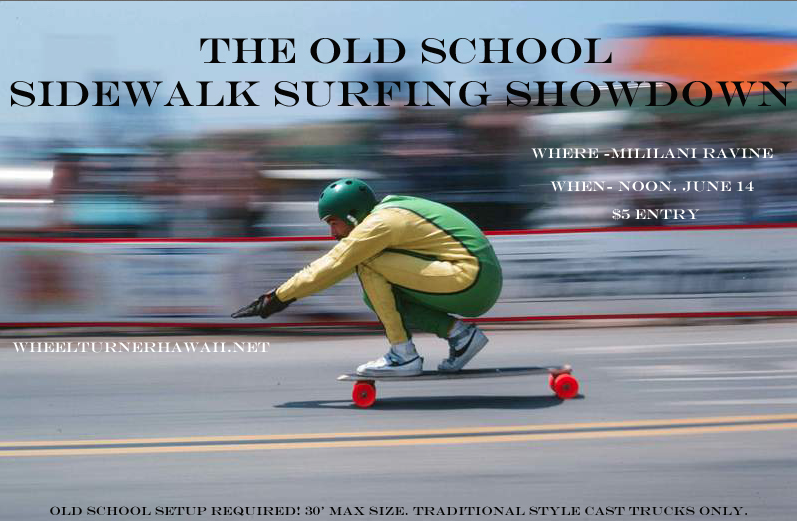 The Oldschool Sidewalk Surfing Showdown. TOMORROW. Get Hyped to throw it back to the old times and surf some sidewalks... TOMORROW. The WheelTurnerHawaii Oldschool Sidewalk Surfing Showdown is tomorrow and is gonna be nothing but good times. If you haven't herd about it , CLICK HERE for all of the scoops. Make sure to bring your old school setup, entry fee to go to the winners, helmets and positive vibes.